The building collapse at the Salvation Army Thrift Store just around the corner from our American Red Cross office is a terrible tragedy. Because it happened to the Salvation Army, one of our long standing friends and partners in times of disaster, it hits extra close to home. Because no homes were affected and there weren’t any evacuations, my initial instinct was to say “Nothing yet.” I ultimately didn’t say that, but I should know better than to even think it. That’s because the Red Cross did do and is doing a lot. 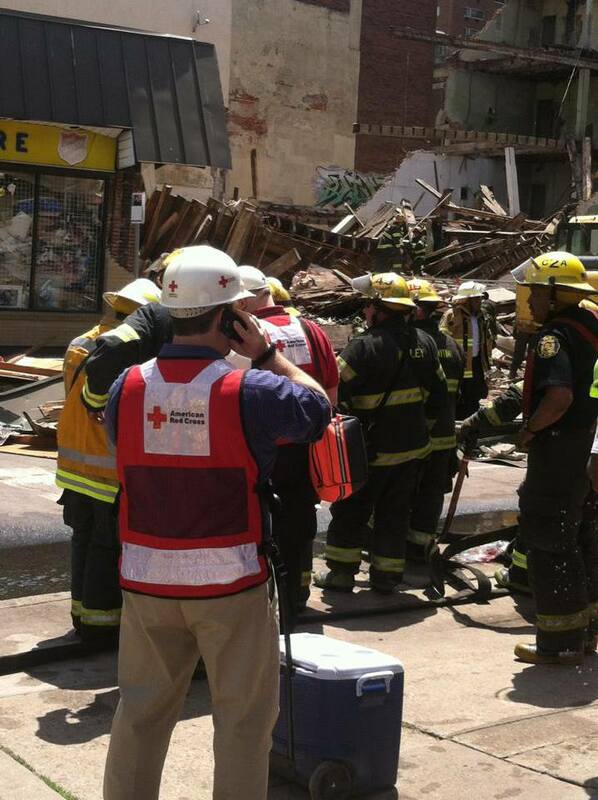 Yes, it’s not the traditional role you think of when you think of the Red Cross responding. We didn’t set up a shelter and feed dozens of people displaced by a fire or hurricane or flood. We weren’t explaining how to prepare for an impending emergency. What we were doing, though, was equally as vital and something the Red Cross has always done and done well; we supported the first responders and provided emotional comfort to those immediately affected by the disaster. In the case of the building collapse, that involved giving water, food, and a place to rest for the firefighters and other search and rescuers. 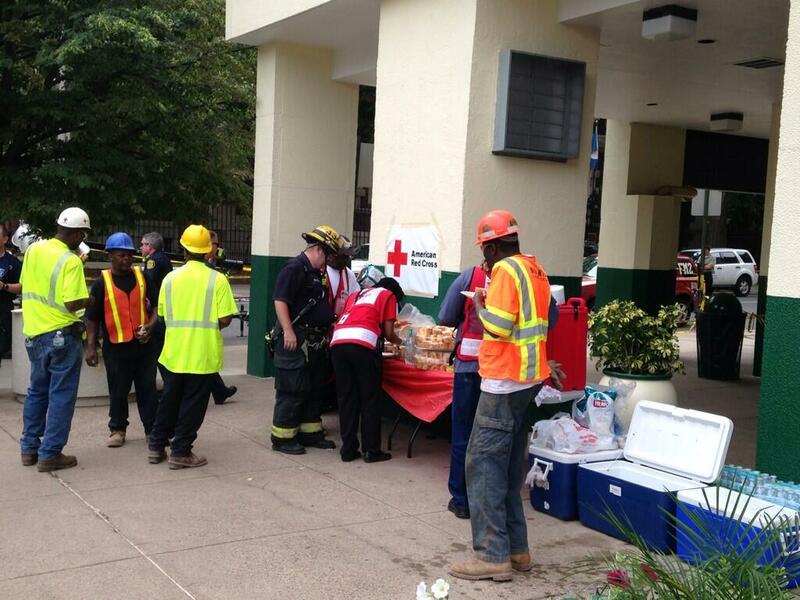 Search crews at the scene of the building collapse in Philadelphia take a lunch break at the American Red Cross comfort station. The Red Cross even provided a much deserved water break for one of the rescue dogs. 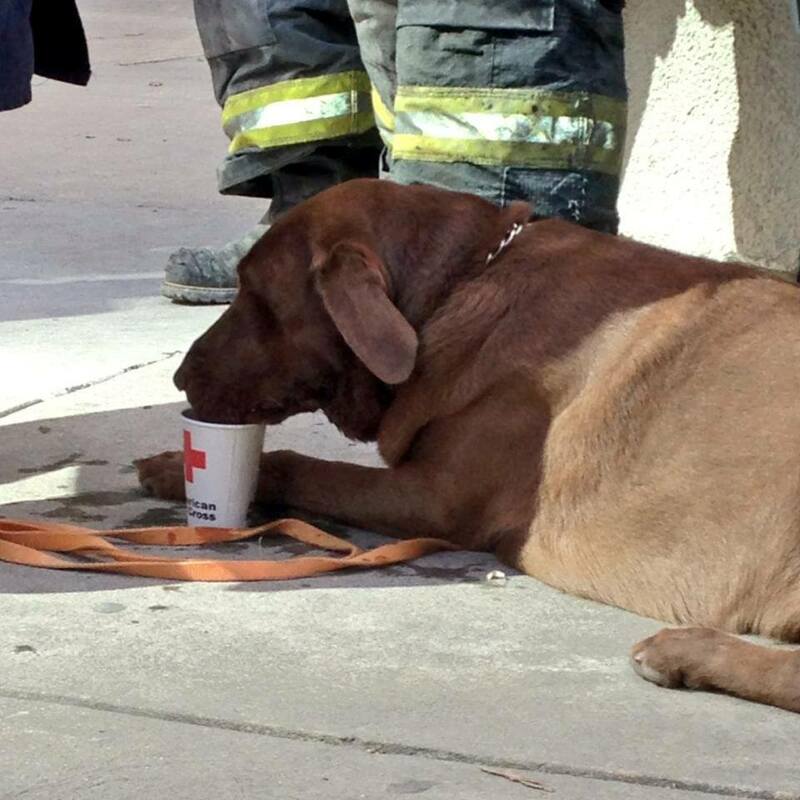 Phoenix, one of two rescue dogs working the scene of the Philadelphia building collapse gets a much deserved water break thanks to the American Red Cross. For members of the Salvation Army dealing with the loss of friends, co-workers and customers, we provided arms to hugs, shoulders to cry on, and ears to listen. To the community at-large, we offered counseling for those having trouble coping with the tragedy. The Red Cross chips in wherever and whenever needed. No two disasters are the same. Needs are never the same. What makes the Red Cross so good at what it does is its unending ability to meet the needs at that particular moment and change when the needs change. As a communications person with the job of telling the Red Cross story, explaining how we are feeding and sheltering people is more high profile. It generates greater media interest. Explaining “canteening” and emotional support is more nuanced and less flashy, but critical just the same. Sometimes I need to be reminded of that.